Pine Lodge West Coast self catering for couples at Kishorn. 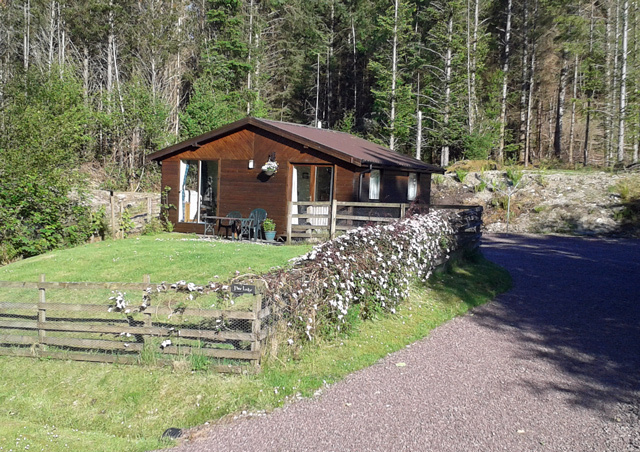 Pine Lodge is situated on a working croft in the village of Achintraid on the shore of Loch Kishorn offering superb views over the loch to the Applecross mountains. The lodge has recently been re-fitted throughout offering very comfortable self catering accommodation for couples in this spectacular west coast location. An ideal centre for boating, fishing, hill-walking, climbing, wildlife, seal spotting, cycling and relaxation. Due to there being sheep and poultry on the croft, dogs are allowed but must be under control at all times. There is a fenced garden with the property. If you are contemplating two weeks holiday in Scotland, Kishorn would make a perfect first week before coming on to one of our other cottages at Loch Ness, but there is so much to see and do in this area that you could easily spend your two weeks here. The village of Kishorn has a general store and post office and an excellent seafood snack bar offering delicious locally caught fish and shellfish. 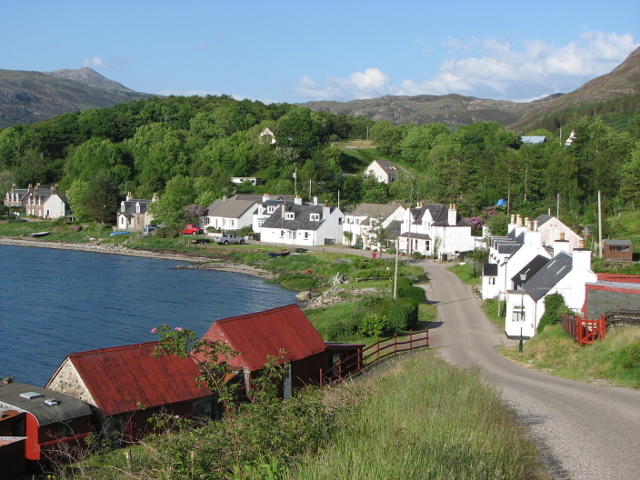 Lochcarron is just seven miles away offering shops, hotels, restaurants and garages. Bike hire available in the village. The local craft shops and the Lochcarron Weavers are well worth a visit. Twelve miles around Loch Carron are Attadale Gardens which have an abundance of plants, trees and shrubs, together with brilliant displays of rhododendrons and azaleas, against a backdrop of pine and heather clad mountains. A drive over the Bealach Na Ba (Pass of the Cattle) provides breathtaking views of Loch Kishorn and across to Skye, leading you to Applecross where there is an award winning pub/restaurant and beautiful unspoilt beaches which offer stunning views of the isles of Raasay and Skye. 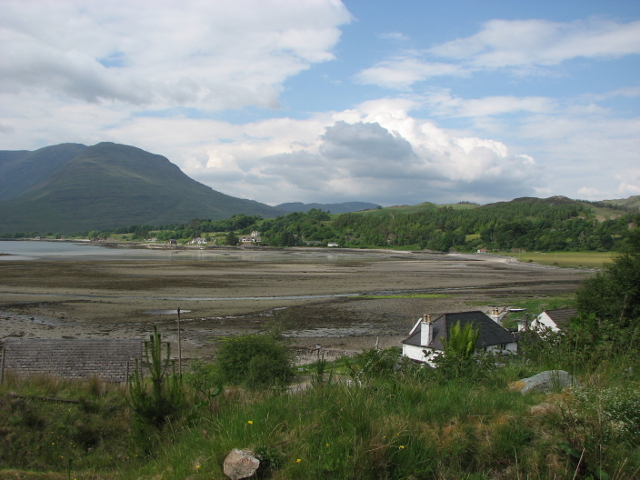 In Torridon, there is a Countryside Centre devoted to Red Deer and other wildlife in the area. Whilst staying at Pine Lodge you may catch a glimpse of the resident Pine Martens or see the otters in the bay. Roe and red deer are often seen around the chalet at dusk and early morning. Golden Eagles have been spotted whilst making the trip to Applecross and in the Kishorn Glen, so don't forgot your camera! If your heart is set on a holiday in a log cabin and Pine Lodge is booked then why not have a look our similar properties that can be found on the Log Cabins page. Lounge with SKY TV, DVD, CD player. 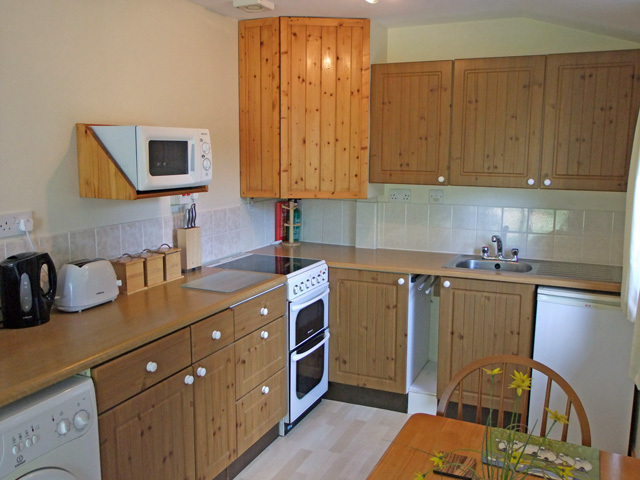 Kitchen - Fully equipped with, electric cooker, microwave, fridge with small freezer compartment, washer/dryer. Shower room, with WC, hand basin. Bed linen. Please note towels are not included but can be supplied at £5.00 per set. Two pets are allowed at the property. A filling station is available in the village of Lochcarron. An additional community filling station is available in the village of Applecross, open 24/7 the pumps are automated and accept credit and debit cards. The Loch and the Mountains. Wonderful walks in quiet woodland and on the open hills. Peaceful west coast location in stunning surroundings. Ideal for touring Scotlands West Coast. Absolutely fab time at Pine Lodge, a perfect base for exploring the Western Highlands. The cabin is comfy, well equipped and has plenty of space. 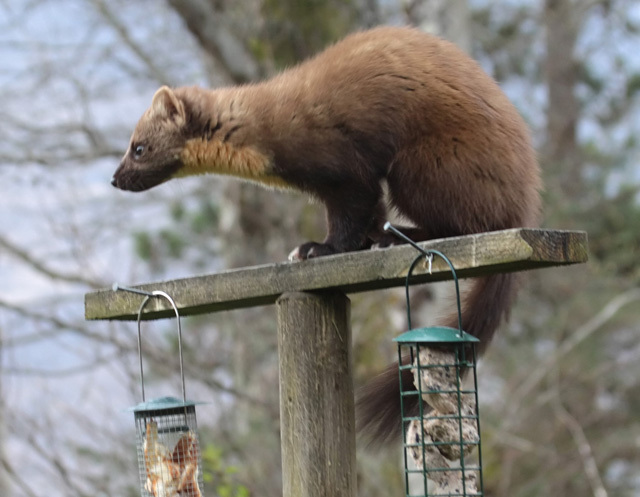 There's a lovely view over Loch Kishorn and the garden is visited by many beautiful birds AND, of course, the famous Pine Marten. Would recommend Pine Lodge without hesitation and would definitely book it again in the future. A wonderful stay for both of us! We spent a wonderful week at Pine Cottage which met and indeed exceeded our needs. It is situated in beautiful surroundings with good access to great walking, cycling and touring country. Negatives? - None. 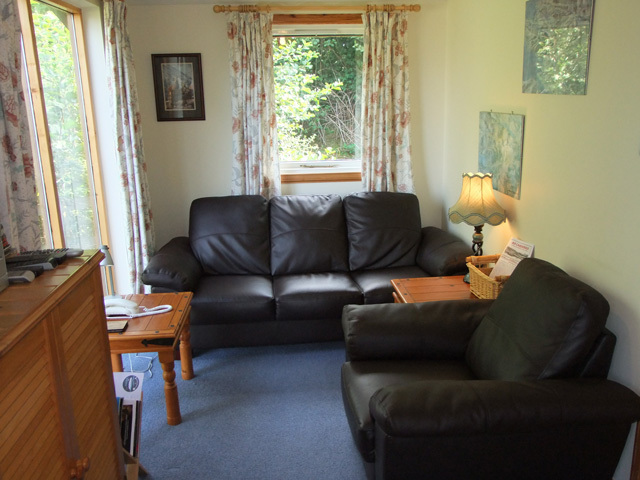 Compact but very cosy and comfortable accommodation with stunning views across Loch Kishorn to the Bealach na Ba and the mountains of Applecross. A great base for local walks and wildlife spotting, even in November. In fact the autumn colours, rainbows, and first dusting of snow on the tops ensured a most enjoyable 'off season' holiday. Regular visits from the local pine marten contributed to the evening entertainment. Free range eggs available from the croft were also much enjoyed. Had a wonderful relaxing week here in October. The resident pine martin did not disappoint and visited us every second night around 9pm. What a beautiful creature and one of the main reasons we booked. Got some great photographs. Pine lodge is compact yet comfortable and has everything you need. Wi-Fi is fantastic considering the location. The road up to the lodge is a bit steep and rough but this is quickly forgotten once you are there. Location is very quiet and peaceful and a great place to escape. The views over the loch and mountains are simply breathtaking. Would highly recommend pine lodge and hope to visit again very soon. Had a great stay at pine lodge. Accommodation was very cosy and well equipped ideal size for me, my husband and the dog. Greatly entertained by the daily/nightly wildlife visits including the pine Martin. Scenery was fantastic and the lodge was in a good central location for getting out and about. This was an excellent chalet with lots of privacy and stunning views of the 'Bialach na ba' on the Applecross peninsula. The weather was wonderful and the stay was further improved by nightly visits to the garden by a Pine Marten. Pine Lodge is accessed via a very steep short track. In the trees above Loch Kishorn, with views across the water to the spectacular pass to Applecross. Spotlessly clean, comfortably furnished and warm. Small but perfectly formed. If the local Pine Marten had been any friendlier it would have joined us on the settee watching Eastenders! We would happily return. Have stayed at Pine Lodge on many occasions it's amazing. Sally and John are brilliant they do an amazing job to make sure you have a brilliant stay. I would definitely recommend it to everyone. A lovely lodge, very comfortable and clean with all amenities needed, it is situated in a beautiful location with stunning view over Loch Kishorn, very secluded and peaceful with some wonderful wildlife to watch, we would definitely consider going back again. Well worth considering to get away into the unspoilt countryside around about and is an ideal base to explore this area of Scotland. Have recently returned from our fourth visit to Pine Lodge. As always, cottage was clean, comfortable, warm and peaceful; John and Sally friendly, helpful but not obtrusive. The view from the cottage is spectacular and the wildlife outside the window kept us entertained: at least 11 species of birds around the feeders, deer at the end of the garden and we were privileged to have 10 visits from a pine marten. Beautiful scenery wherever you go. Have already booked holiday number 5 - can't wait! We stayed for a week before Christmas 2007, and had a lovely time! The weather was just fab! Lovely walks with our dog, suberb scenery. Just acroos the Loch and over the Applecross Mountains is Applcross, and a fantastic pub called the Applecross Inn which serves the most amzing fish and chips, and the best pint of Guniness I ever had! We will definatly be back for more! This was an absolutely exquisite holiday! The cottage is much lovelier than it looks on the site, the views are spectacular and the surrounding areas are beautiful. There is nothing more the owners could have equipped the cottage with - they have really thought of everything. Definitely worth visiting again, in summer, although it made a lovely Christmas break too! We stayed at Pine Lodge Cottage from 13th-21th of August. Such a peacefull place. The pictures on this site do not do the cottage any justice. I guess you just have to feel it; the view, the unspoiled surroundings, the silence [you only hear a few sheep and a bird now and then]... it was so much more than we expected. Since we didnt have a car we were limited to see the surroundings but we made beautiful walks in the area and cycled to Shieldag. We had to return to Glasgow on Saturday [to catch a plane to Holland] and were in complete shock by the noise and the fumes in that city... we wanted to go back immediately! John [and Sally of course], thanks again for your hospitality! You know that sensation when you foolishly invest in a glossy, overhyped product only to discover on reciept that one has been done. Well it is far from the reality of the Wilderness Cottages experience. The lodge owners John and sally were low key, modest hosts. They need not have been. Their lodge proved a real home from home for us and our dog Bruges. Why so many people jet abroad without taking a broader account of what is at home is beyond me. Long may they continue to do so, because selfishly it increases the availability for the likes of us. Corrrine was helpful and motherly to us first timers. She understood our needs of total solitude and the right kind of civilisation within reach when needed. Our break was the perfect therapy for us. I do however suspect it would be the perfect therapy for anyone. You need not believe me, give it a go yourself. Thank you John and Sally. P.S we have bookedd up for Pine Lodge this new year. Why would we not ? 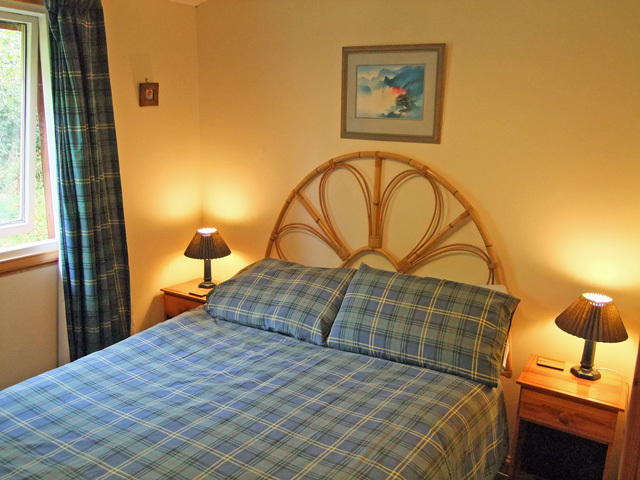 Pine Lodge is in a beautiful location overlooking Loch Kishorn. It is perfect for a couple (and pet). It is peaceful and secluded, set on the edge of a pine forest, with views over the loch and the mountains beyond. It is self contained, well equipped, comfortable and warm. Kishorn Seafood Restaurant (about 1 mile away) serves locally caught produce and is definitely worth a visit. A trip over the treacherous Bealagh na Bha (pass of the cattle), with its astounding scenery, to Applecross for a meal at the Applecross Inn and a fantastic sunset is a must (get there early if you want a seat).